Internet chat forums are a great way for people interested in the same topic to get together to create a community where they can talk to each other and share knowledge. Since its inception in 1998 by Simon Wright (when it was primarily a watchdog snapping at Telstra’s heels), it has become the premier destination for users seeking Australian broadband Internet resources. As well as its rich source of broadband news and information, Whirlpool boasts one of Australia’s largest technology-related online communities. I joined Whirlpool on 26 February 2002. In fact one of the first people I talked to was Simon Hackett, owner of a small South Australian ISP called Internode who encouraged me to become one of their very first Sydney ADSL customers. Over the years since I’ve added over 3000 discussion posts to Whirlpool. Whirlpool is a great place to talk about Broadband ADSL/Cable internet access in Australia, but there are also sub-forums on Whirlpool on many other topics including: Computer Hardware and Software, General chat (Music, Gadgets, Movies, Sport), the IT Industry, Mobile phones/internet access and more. Overclockers Australia, or OCAU, was founded in July 1999 by James “Agg” Rolfe. Since then the OCAU Forums have grown into one of the busiest PC enthusiast forums on the net including a very popular Buy, Sell & Swap area and sub-forums covering other areas of interest including topics like Photography, Entertainment (TV, Movies, Music, Books, etc), Fitness and Current Events/Serious Discussion. I joined the OCAU forums on 11th October 2002 and while I’m not as active there as at Whirlpool Forums I regularly drop in to read the latest technology news and reviews as well as using the Buy/Sell/Swap forums. Since being establised in December 1998, Digital Photography Review (DP Review) has become the most popular digital photograpy and digital imaging Internet resource designed and maintained by photographers for photographers. DP Review has since become famous for its detailed, honest and highly respected digital camera news and reviews and one of the most active and informative Internet photography forums. I have used DP Review many times to decide which digital camera to buy for myself or to suggest for friends/relatives. 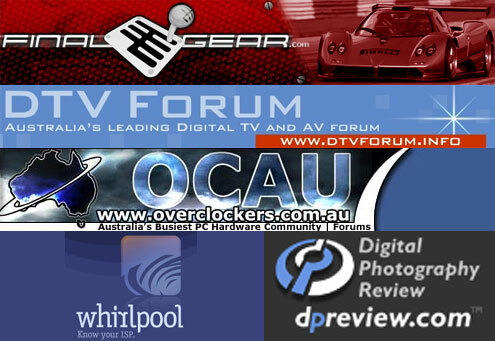 DTV Forum is Australia’s leading internet chat forum focussing on Digital TV, Digital AV/Home Theatre, TVs, PVR/DVRs and Digital Set Top Boxes. It was originally funded by the Australian Government’s “Digital Broadcasting Australia” (DBA) authority in August 2003 but has since been changed to private ownership by On-line Forum Pty Limited. It is moderated by the same people who managed the DBA Forum for Digital Broadcasting Australia. I joined DTV Forum on 5th February 2006 when I first got access to Digital TV after buying a Digicrystal 9000 PVR. It’s been a great place to get advice about TV antennas, which PVR and other TV related equipment to buy etc and share my knowledge of Digital TV related products I’ve purchased. I’m a big fan of the British motoring/entertainment TV show Top Gear from the BBC. When I want to know the latest Top Gear news I always head to FinalGear.com Forums the #1 resource on the internet for Top Gear shows and feature news, video clips, links to BitTorrent files for full episodes and much more. Overclockers Australia is a pretty good site. Very helpful for PC persons like me. I have learnt so much from internet forums. Having had only 1 TV since 1980 and looking to purchase another I learnt all about HD TV and HDD recorders form DTV Forum. Now I am looking to purchase a new point and shoot camera, an upgrade from my DSC S60 but I’m finding DPreview a bit overwhelming. Have you listened to Tech talk Radio yet? It’s similar to TWIT but in my opinion better. That’s a great post. I have also just looked at the Aussies Living Simply forum mention by Gerri. That looks really interesting. Thanks Gerri. AVSForums is one of my favorite forums… they have everything you need for your home audio needs. Helped me build my Windows Home Server. Thank you for sharing.I prefer the Whirlpool Forum usually. Its kinda like an aussie dig. It Rocks and its very pertinent. You can catch literlly up to the second breaking news on there.